Goodbye, Mr Lee - Temasek Club NSW Inc. 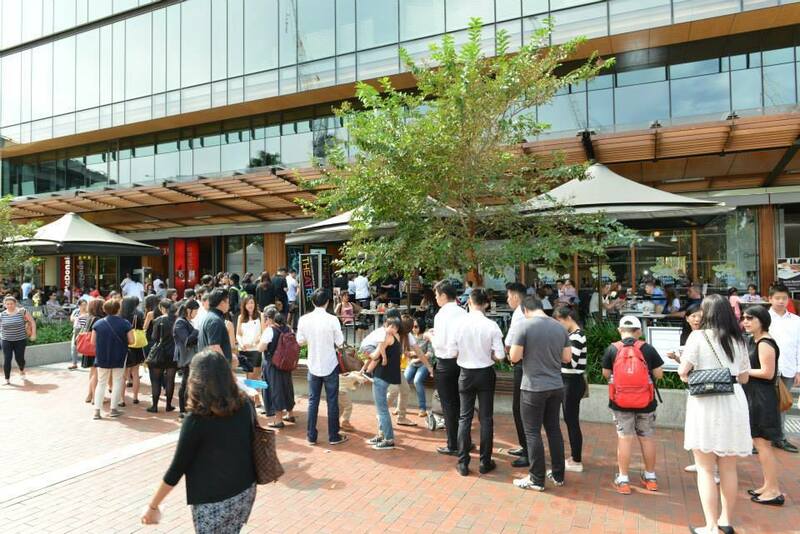 Some 500 Singaporeans and their friends gathered on Sunday at Darling Quarter, Sydney, to join countrymen back in Singapore in bidding their final farewell to the late Mr Lee Kuan Yew, the nation’s founding Prime Minister. 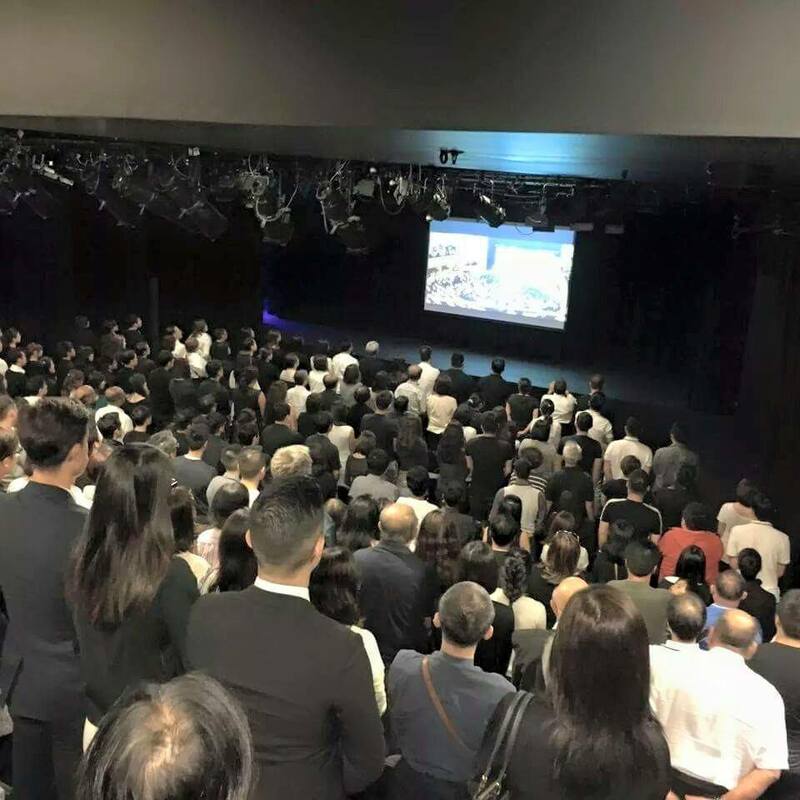 They watched, via live-streaming on the theatre screen, as Mr Lee’s cortege departed Singapore’s Parliament House and made its way across the city and iconic docklands of the statesman, before arriving at the University Cultural Centre (UCC), where the state funeral was held. The gathering was an initiative of Temasek Club (NSW) Inc., a Sydney-based social club for Singaporeans and people with an interest in Singapore. 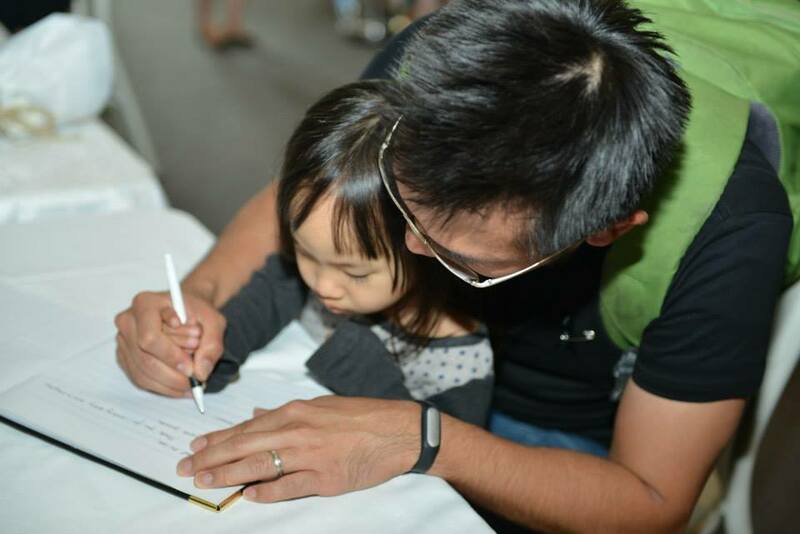 As many as 200 people began queueing up to sign on condolence books – two hours ahead of the scheduled telecast. “It was a hurried decision and we are very grateful to all the members, non-members, as well as students who volunteered to help,” said Miss Angela Lee, vice-president of Temasek Club. Many took a while to compose the messages they would leave on the condolence books. Some came with bouquets of flowers, while young children left behind their handmade cards with messages of gratitude and goodbyes. “Thank you for all that you’ve done for Singapore. I hope you get to reunite with the special love of your life,” wrote one, making reference to Mr Lee’s late wife, Madam Kwa Geok Choo. The theatre was quickly filled and an additional TV monitor and extra seats had to be placed in the foyer for those who could not get into the theatre. The moment of unity came when all the attendees at the theatre rose to their feet together with the 2,200 audience at UCC as the casket was carried on stage. Some began to sob as they listened to Prime Minister Lee Hsien Loong, the eldest son of Mr Lee, deliver an emotional eulogy of his father. They also laughed together with former Prime Minister Goh Chok Tong and former Senior Minister of State Sidek Saniff as they shared their own anecdotes about the frugality of their demanding former boss. They solemnly sat through the eulogies until the end of the service, when they shared a minute of silence, recited the Singapore National Pledge and sang the National Anthem, with Singaporeans home and abroad, as one. The queue for attending the live-streaming of Mr Lee Kuan Yew’s State Funeral will begin at 3 pm. As the capacity of the theatre is limited, seating will be available on a first-come-first serve basis. As the event is held on commercial property, which is only available to us from 3pm, we apologise if there is a delay in our telecast. We will minimise any delay as much as possible. Thank you for your understanding. 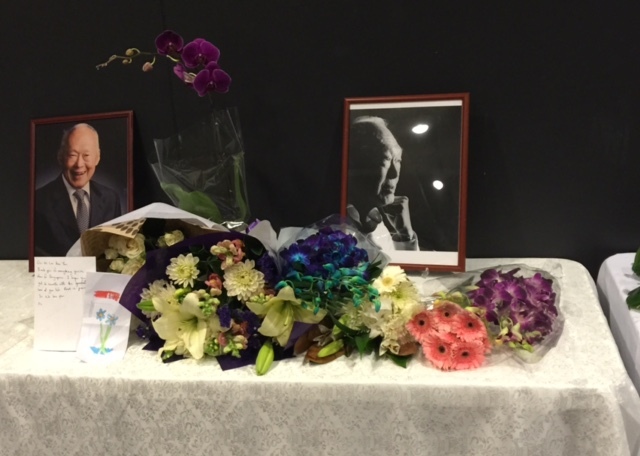 Condolence letter from Temasek Club (NSW) Inc.
On behalf of the Temasek Club (NSW) Inc. and its members, it is with great sadness that we extend our deepest sympathy and condolence to the demise of our founding father of modern day Singapore. Mr Lee Kuan Yew has dedicated his life to create conditions that ensured the survival and success of Singapore. His achievements and sacrifices will forever be etched in posterity. Singaporeans will always be proud of how he has made Singapore stand out on the international stage. He has built a modern day nation that has all the trappings of comforts and peace in the world – important ingredients for a society to thrive. His passing is not only a loss to Singapore but the world at large as his wisdom and good counsel will now forever be missed. Whilst we mourn the loss, his legacy will continue to inspire us to strive for excellence, as he had done for the nation. May peace be with you and your family, and the whole of Singapore.